Arctic Monkeys are embarrassed by their older lyrics. 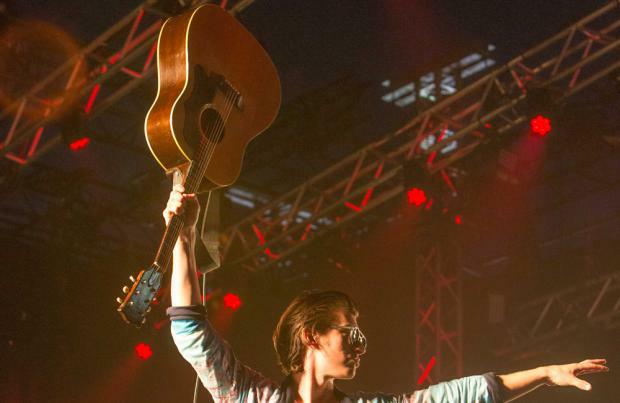 The 'Do I Wanna Know' group's frontman Alex Turner has admitted he left behind lines like, "They're all infected but he'll be alright, cause he's a scumbag don't you know", from 2006's 'When The Sun Goes Down' and, "Now then Mardy Bum/I see your frown/And it's like looking down the barrel of a gun", from 'Mardy Bum', when making the band's new record 'Tranquility Base Hotel & Casino'. He confessed: "I think sometimes that can be helpful. In preparation for going on tour, we flicked through some of our old records. "There were a few lyrics that went by where I thought [wincing noise], 'Don't know what you were thinking there. Probably leave that one out now.'" The 32-year-old rocker also revealed that the band's space theme on their sixth studio album is very much inspired by the sci-fi films and tomes he studied. Asked about the theme, he told Annie Mac on BBC Radio 1: "It might have had something to do with some of the stuff I was reading and films I was watching around then. "I think it started with the idea of science fiction and the worlds that are created in it or the idea of space travel, time travel or whatever it is, is used to put out an idea about the world we're living in." The 'R U Mine?' hitmaker has traded the guitar for piano on the record - the long-awaited follow-up to 2013's 'AM' - because he wasn't feeling inspired by the stringed instrument anymore. He explained: "The guitar had lost its ability to give me ideas. Every time I sat with a guitar I was suspicious of where it was gonna go. I had a pretty good idea of what I might be which is completely contrary to what I felt when I sat at the piano." 'Tranquility Base Hotel & Casino' is out now, the band head out on a UK tour kicking off with two consecutive dates at Manchester Arena on September 6 and September 7.